Kimihiro Tsutsui (筒井 公宏 Tsutsui Kimihiro) is a character from the anime and manga series Hikaru no Go. 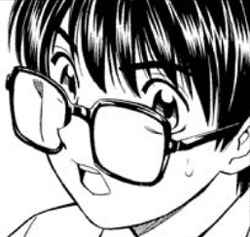 Kimihiro appears in the early chapters in a tournament. Kimihiro enjoys the intellectual pursuits of Go and is more of a strategist than a Go player. Later Kimihiro finds Hikaru Shindo at Haze Middle School's festival. Kimihiro asks Hikaru (Fujiwara-no-Sai is at first doing the problems for Hikaru) to solve Go problems in exchange for a book written by Toya Meijin. The first problem is easy, therefore Hikaru asks Sai if he can do it. Hikaru gets the right answer gets a tissue. Hikaru knows Sai wants the book, so he solves another problem, but gets a can of soda. Kimihiro then puts out a problem that he believes that Akira Toya can solve. Tetsuo Kaga steps in and solves the problem by putting his cigarette out on the board (this is replaced by Tetsuo placing chewing gum on the board in the English-language versions of the graphic novels and all versions of the anime). After the confrontation between Tetsuo and Hikaru is over, Hikaru joins Tetsuo and Kimihiro in the Haze Middle School tournament. Kimihiro originally relies on a Joseki book (titled "100 Essential Joseki") during his games, but he improves after he stops using the book after the second game of the tournament. The group defeats Kaio Middle School but is disqualified because Hikaru is actually a sixth grader in elementary school. Later Hikaru joins the Go club, and Kimihiro and Hikaru dream of defeating Kaio Middle School once again. Yuki Mitani joins the club and the three go to the Summer tournament. The three are then trounced by Kaio in the tournament. Kimihiro along with Tetsuo has graduated from Haze Middle School which made Kimihiro's dream of seeing Kaio lose to his goal club a failure. In the Special Bonus: the Haze Middle School Actors present Assassination at Honnoji Temple, Kimihiro Tsutsui plays as Nikkai (Hon'inbo Sansa) of Jakkoji Temple. Kimihiro's voice actor (seiyu) in the Japanese version of the anime is Makoto Tsumura. In the English version his voice actor is Keith Miller. Kimihiro's shares his family name with a real life Go player, Tsutsui Katsumi (筒井勝美 Tsutsui Katsumi). Also at the last ending you will see Tsutsui with this girl. She it his girlfriend.